“The greatest purveyor of violence in the world today: my own Government… I cannot be silent.” – Rev. Dr. Martin Luther King, Jr. The King Memorial lists a total of 15 direct quotes and a paraphrase (currently in controversy) from Dr. King’s words; yet, curiously, this particular quote – which ties together the struggle for social and economic justice at home with the actions of the government abroad in an elegant and profound way – did not make the list. Within the list, there is one quote which deals directly with the Vietnam war, two that deal directly with war, and others that deal, in one way or another, with issues of war and peace in general. One is lifted from the Riverside speech. The first, from the “I Have a Dream” speech, is “Out of the Mountain of Despair, a Stone of Hope” – the quotation that serves as the basis for the monument’s design. The words on the other side of the stone read, “I Was a Drum Major for Justice, Peace, and Righteousness,” which is a paraphrased version of a longer quote by King: “If you want to say that I was a drum major, say that I was a drum major for justice. Say that I was a drum major for peace. I was a drum major for righteousness. And all of the other shallow things will not matter.” The memorial’s use of the paraphrased version of the quote has been criticized (Wikipedia). “When met with hardship, when confronting disappointment, Dr. King refused to accept what he called the ‘is-ness’ of today. He kept pushing towards the ‘ought-ness’ of tomorrow. Not a word about “the greatest purveyor of violence in the world today” – this is particularly odd when one considers that the US is now currently involved in more war and destruction, in more places and involving more people, weaponry and expense, than at the time Dr. King uttered those words in 1967. “And as I ponder the madness of Vietnam and search within myself for ways to understand and respond in compassion, my mind goes constantly to the people of that peninsula. I speak now not of the soldiers of each side, not of the ideologies of the Liberation Front, not of the junta in Saigon, but simply of the people who have been living under the curse of war for almost three continuous decades now. I think of them, too, because it is clear to me that there will be no meaningful solution there until some attempt is made to know them and hear their broken cries. Don DeBar is a journalist and political activist residing in Ossining, NY. He currently serves as senior producer for WBAIX.org, an internet news and public events outlet featuring progressive producers who were purged from Pacifica Radio. A medical bill has been signed into law in Turkey that requires doctors to obtain government permission before administering emergency first aid. Critics have blasted the bill as a crackdown on doctors who treat activists injured during protests. The bill, which was drawn up by the ruling Justice and Development Party (AKP), punishes health care professionals with up to three years in prison or a fine of almost $1 million if they administer emergency first aid without government authorization. It also bans doctors from practicing outside state medical institutions and aims to stop them from opening private clinics. President Abdullah Gul signed the legislation into law Friday. It has prompted a flurry of accusations from rights groups, condemning it as an attempt to criminalize emergency health care and deter doctors from treating protesters. The US-based Physicians for Human Rights (PHR) attacked the legislation as an attempt to quash dissent in Turkey, following last year’s violent protests. “Passing a bill that criminalizes emergency care and punishes those who care for injured protesters is part of the Turkish government’s relentless effort to silence any opposing voices,” PHR senior medical adviser Vincent Iacopino said in a statement on the PHR website. The PHR says the bill will also put the medical community at odds with their ethical and professional responsibility to care for the sick and wounded. In last year’s wave of protests against Prime Minister Tayyip Erdogan, six people were killed and over 8,000 were injured across the country. The government was accused of cracking down on medical professionals when the Turkish Health Ministry launched a probe into those doctors treating protesters in June. They asked the Turkish Medical Association (TBB) to hand over the names of the doctors and their patients. “Recently we were inspected by the Ministry of Health, they said what we were doing here is wrong. But there could be no punishment for those who are helping people. There is no such religion or law that could discriminate against us,” Abtullah Cengiz, spokesman for the Gezi Park doctors, told RT in June. GAZA CITY – A young Palestinian man and a child were injured on Sunday morning after Israeli air forces launched three strikes across the Gaza Strip. An Israeli airstrike in the northern Gaza Strip hit a motorcyclist on Saftawi Street near Jabaliya, injuring the driver and a number of passersby. Two other airstrikes in the central and southern Gaza Strip left no reported injuries. Spokesman for the Gaza Strip Ministry of Health Ahraf al-Qidra told reporters that the motorcyclist was a 22-year-old man, and that he was taken to al-Shifa Hospital in Gaza City after he sustained serious injuries. Al-Qidra added that a 12-year-old boy was taken to Kamal Udwan Hospital in Jabaliya, and that doctors said he suffered moderate wounds. A statement by Israeli forces said that they had “successfully targeted a terrorist operative” named Ahmad Saad, who they described as “a senior operative in the ‘Palestinian Islamic Jihad'” organization. The statement added that Saad was a specialist “in rocket launching” and is “personally responsible for the launching of 5 rockets towards Ashkelon” on Thursday. Also on Sunday morning, Israeli air forces bombed two sites in the central and southern Gaza Strip used as training sites for Palestinian militants. Witnesses told Ma’an that at least three missiles hit a military training site in the town of Bani Suheila east of Khan Younis in the southern Gaza Strip. The site and neighboring civilian houses sustained material damage, but no injuries were reported. Less than 10 minutes later, another Israeli airstrike targeted a training site of the Hamas’ military wing the al-Qassam Brigades near Nuseirat refugee camp in the central Gaza Strip. No injuries were reported in that strike either. 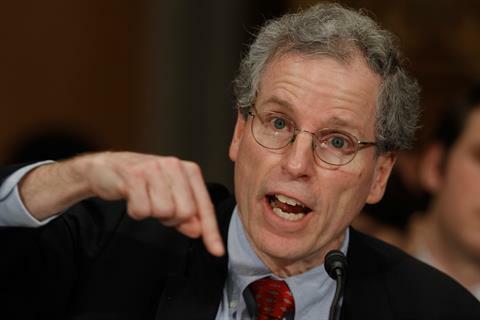 The US Ambassador to Syria Robert Ford has ordered foreign-backed opposition figures to take part in the international peace conference, noting that there are many changes in Saudi policy regarding the Syrian crisis. Quoting an official in the executive committee in the so-called “Syrian National Coalition”, Nidal Hamade said that Ford had called for an urgent meeting for the SNC figures in Istanbul, noting that the US envoy had threatened to cut funds for anyone who will not attend the meeting. In addition to Ford, all SNC figures who were opposing Geneva 2 participation were at the meeting: Loay Safi, Anass al-Abdeh, Haitham al-Maleh, Burhan Ghalioun, Najeeb al-Ghadban and Maher Noaimi, Hamade wrote in his corner on al-Manar Website. During the meeting, Ford told the SNC figures that Saudi prince Bandar Bin Sultan is on a long vacation in the United States, “because of sickness and psychological fatigue,” Hamade added, citing the Syrian opposition official who is also close to former Prime Minister, Riyad Hijab. The US ambassador added that the Saudi committee for Lebanon and Syria (which comprises Abdulaziz Khoja, Abdulaziz Bin Abdullah Al Saud and Muqren Bin Abdullah Al Saud) is to be activated and will take over the Lebanese and Syrian file from Bandar. Press TV has conducted an interview with Ralph Schoenman, author of Hidden History of Zionism, from Berkeley, California, to discuss Israel’s use of nuclear bombs to terrorize and dominate populations with the help of the United States. Press TV: First of all, with this report in, will there be any political or legal implications for those who assisted Israel in acquiring these nuclear weapons? Schoenman: The question is really going to the relationship of imperialism to the Zionist [entity] from its inception, in specific terms now the issue of the use of nuclear weapons. There is a book,The Unspoken Alliance: Israel’s Secret Relationship with Apartheid South Africa, by Sasha Polakow-Suransky, which details the joint development of nuclear weapons by including neutron bombs by Israel and South Africa, and their testing. The well-known figure Mordechai Vanunu – who was kidnapped by the Israelis when he disclosed the evidence of the Israeli preparations for nuclear capacity and testing of weapons, indeed, with the full panoply of evidence pertaining to this – was kidnapped, taken to Israel and held in incommunicado for 18 years. There is a very sorted and menacing history of the use of these weapons to menace peoples across the world. I want to give a specific example in illumination of this, namely ‘View of the Cameroon Disaster…’, which Dan Fisher wrote about in the Los Angeles Times on August 27, 1986. Death occurred in which people were found frozen in place as if they have been killed by gas. This was an event in 1986 in Cameroon – it was immediately described as an event in which the Israelis were involved. The Israeli infantry troops were soon to be on the scene. In fact, Shimon Perez, who was the former Foreign Minister and Prime Minister of Israel, was quickly on the scene with a team. Indeed, the evidence about this was documented by Dan Fisher in the Los Angeles Times, as I’ve mentioned, but also there was a detailed account by the Cameroonian journalists which specified the role of the Israelis and the evidence of a neutron weapon: ‘The Lake Nyos Disaster 20 Years After: Revisiting Israeli Connection’, by Dibussi Tande. My wife and I had a role in this expose because after the time we flew to the big island of Hawaii where leading volcanologist in the island of Hawaii was involved in the report on what occurred in Cameroon, he confirmed that the claims that this was the result of gases emerging from a lake with presumptive latent volcano that emitted gases in Lake Nyos, those gases then reached the atmosphere in causing thousands of people to die in their tracks frozen, while no damage to property occurred, was quickly exposed as a myth. In fact, what we’re dealing with here is a neutron weapon. One of the people who’s most associated with the neutron bomb, Sam Cohen, who was working with the RAND Corporation in the United States, has detailed the neutron weapon. There is no question whatsoever, given what Vanunu has exposed, given what evidence there is in Cameroon, that neutron weapons have been used and tested by the Israelis with the approval and collusion of the United States and the imperial powers notably France. This is not a new development. The story is important. It is the culmination of a series of documentations, revelations over a period of 20, 30 and 40 years. These are crimes against humanity. These are ongoing threats to the peoples of the world. They define the relationship of Israel and the Zionist [entity] to imperialism and the utilization of the nuclear capacity and of neutron bombs and weapons of this nature to terrorize the populations they seek to dominate, whose sovereignty they wish to destroy. | The Left lionises Edward Snowden, but who will stand up for Israel’s Mordechai Vanunu? 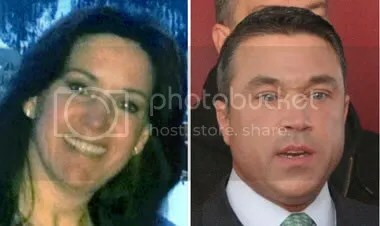 Diana Durand, a Texas woman who apparently has been romantically involved with Congressman Michael Grimm, has been arrested and charged with illegally funneling money into the New York congressman’s 2010 campaign. She is also accused of steering “straw donations” into the campaign of yet another congress member, Rep. Aaron Schock (R-IL), according to the New York Daily News. A straw donation is a donation to a political campaign made by one person, though under another person’s name. It is a way of getting around legal limits on the amount of money that can be contributed to political candidates. Schock, like Grimm, is an avid supporter of Israel. Durand is 47-years old and was arraigned in federal court in Houston on Wednesday. She has hired an attorney, Stuart Kaplan, who is a longtime associate of Grimm, both having served in the FBI. 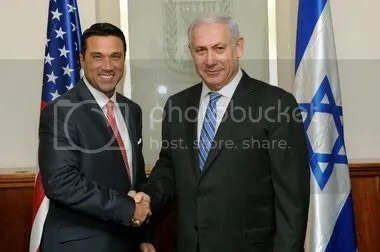 Grimm left the FBI in 2006, was elected to Congress in 2010, and in 2012 the FBI opened an investigation into him over possible illegal campaign donations to his 2010 congressional campaign made by supporters of Israeli Rabbi Yoshiyahu Pinto. The single mother of one worked with Grimm before his election when he launched a trucking company near Houston. Records list her brother and sister-in-law as executives at the firm. Sources said Durand and Grimm, 43, who is divorced, were involved romantically, and that she visited him in Washington after his election. Durand was busted Friday, nearly five months after a Brooklyn judge first ordered her arrest. Feds spent the intervening months in an unsuccessful bid to win her cooperation in an ongoing probe into allegations that Grimm and supporters encouraged donors to make illegal contributions to his 2010 campaign, people with knowledge of the case said. As I reported previously, campaign donations totaling more than $500,000 were reportedly solicited on Grimm’s behalf by a top Pinto aide, Ofer Biton, who was arrested in 2012 for immigration fraud and who pled guilty to that charge last August. The FBI had sought to have Biton turn state’s evidence against Grimm, but he has refused, and apparently Durand intends doing likewise. Also as I repoted before, Grimm has friends in high places—Israel—where he reportedly maintains close ties to Prime Minister Benjamin Netanyahu, and according to reports, the Israeli police have done their best to sabotage the FBI’s investigation. Schock, 32, is a prolific fundraiser serving his third term in Congress. He had more than $2.9 million in his war chest in September, when the most recent campaign-finance reports were filed. The House Ethics Committee has been examining Schock’s fundraising after reports that in 2012, he solicited $25,000 for a super PAC, in excess of a $5,000 limit for lawmakers asking for money for that kind of independent-expenditure group. The “recent tension” referred to by the signatories of the letter is an incident I referred to in my first article on the Grimm investigation. On March 9, 2010 the Israeli government announced the construction of 1,600 new homes, for Jews only, to be built in East Jerusalem. The announcement coincided with a state visit to Israel by US Vice President Joe Biden, and was viewed by many as insulting to America. Clinton referred to it as “deeply negative” for US-Israeli relations. Coincidentally, simultaneous to the slight against Biden, the parents of Rachel Corrie were in Israel for the start of their civil trial charging the Israeli military in the wrongful death of their daughter. Biden’s response to the announcement of the 1,600 new homes was to issue a servile statement in which he declared that “there is no space between the United States and Israel,” whereupon he boarded a plane and jetted home to America without offering any words of support to the Corrie family. Our valuable bilateral relationship with Israel needs and deserves constant reinforcement. As the Vice-President said during his recent visit to Israel: “Progress occurs in the Middle East when everyone knows there is simply no space between the U.S. and Israel when it comes to security, none. No space.” Steadfast American backing has helped lead to Israeli peace treaties with Egypt and Jordan. And American involvement continues to be critical to the effort to achieve peace between Israel and the Palestinians. We recognize that, despite the extraordinary closeness between our country and Israel, there will be differences over issues both large and small. Our view is that such differences are best resolved quietly, in trust and confidence, as befits longstanding strategic allies. We hope and expect that, with mutual effort and good faith, the United States and Israel will move beyond this disruption quickly, to the lasting benefit of both nations. In Israel, the list of those seeking Rabbi Pinto’s advice reads like a high-society gossip column: Multi-millionaires Lev Leviev and Nochi Danker, opposition leader Tzipi Livni and former Industry Minister Benjamin Ben Eliezer, who the rabbi supposedly brought out of a coma earlier this year. It is even rumoured that Prime Minister Benjamin Netanyahu consults him. Now, however, he seems to be in hotwater with Israeli police, who have charged him with attempting to bribe a police official—apparently in a bid to sabotage the FBI’s investigation of Grimm. The FBI is hoping to have Pinto testify against Grimm, and reportedly is in possession of a wiretap audio in which Israeli police can be heard threatening the rabbi. And finally, as I reported yesterday, Grimm apparently isn’t the only Congress member who has accepted donations from Pinto’s wealthy followers. House Majority Leader Eric Cantor is reported to have as well. The key question is whether the techniques and solicitors used in Grimm’s campaign match those used by Cantor. If so, then the FBI is very interested in Cantor. If Cantor was smarter than Grimm and didn’t use mafiosi to collect cash as Grimm did, then he may not get into trouble. But the very fact that Cantor dipped into Grimm’s cookie jar so heavily is mighty suspicious. Who knows where it will lead? To be clear, I don’t have a smoking gun that points to Netanyahu involvement in sabotaging the FBI investigation. But I do have a series of strong circumstantial evidence that leads in that direction. But why would Bibi or Sara care about this enough to take such risky actions as agitating the FBI? Let’s return to that grand strategy of electing even more Israel-friendly GOP members of Congress. If Michael Grimm was their model to see whether Pinto was a new source of campaign cash, they needed to protect him if he might be going down. Rather than lose their investment and shut down this conduit for millions in new campaign funding, they’d go to the mat to help Grimm. More background on Bibi’s strategy in dealing with the U.S. political process: he’s found that presidents may not like him because they are slightly more independent than members of Congress. But Congress is in his back pocket due to that campaign largess I mentioned earlier. Bibi is hated in the White House but loved (or feared) in Congress. When he can’t get an invitation to the White House, he goes over the president’s head and gets to address a Joint Session of Congress. This is the same strategy he and the Lobby are following regarding the Iran sanctions legislation. The president doesn’t want new sanctions. Most sane members of Congress don’t want them either. But the Lobby and Israel do. They want a war with Iran. So they want to sabotage Obama’s strategy of negotiating his way out of the impasse. How best to do this? Don’t confront Obama head-on because he’s an immovable object on this matter. But do an end-around. Activate all those pro-Israel IOUs in Congress. So the more Michael Grimms there are in Congress, the more Israel has its own interests guaranteed in the halls of Congress. 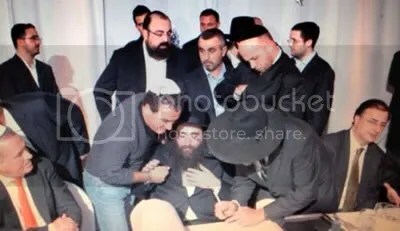 Rabbi Pinto, center, surrounded by oligarchs, including Israeli diamond billionaire Lev Leviev, far right. With scant energy and mineral reserves of its own, and nuclear plants mothballed since the Fukushima nuclear disaster, Japan is investing heavily in exploring beneath the oceans for resources that will power its future. On the first day of 2014, the Japanese research ship Chikyu set a new record by drilling down to a point 3,000 meters beneath the seabed off southern Japan. It was an appropriate way to ring in the new year and signals an increased commitment to learning more about the secrets that lay beneath the floor of the ocean close to Japan. The research has two distinct but connected driving forces. As Japan prepares to mark the third anniversary of the March 11 Great East Japan Earthquake, the Chikyu is undertaking the most extensive survey ever attempted of the Nankai Trough, a geological fault that extends for several hundred kilometers parallel to the southern coast of Japan and widely seen as the source of the next major earthquake that will affect this tremor-prone nation. And with all of Japan’s nuclear reactors presently mothballed in the aftermath of the disaster, which destroyed the Fukushima Dai-Ichi nuclear plant, there is a new sense of urgency in the search for sources of energy and other natural resources close to Japan. “When I was in elementary school, we learned that Japan does not have many natural resources of its own and that we needed to import all the oil, the gas, the metals and minerals that we needed,” Toshiyaki Mizuno, the deputy director of the Ocean and Earth Division at the ministry of science and technology, told DW. “There are many problems that we need to overcome before we can say that Japan’s energy problems have been solved, but the dream is to exploit this new source of energy and other resources and this is the first step in achieving that,” Mizuno said. The Japanese government has announced plans to work with private companies to develop new technologies to explore the resources that are below the seabed off Japan, including the development of advanced submersibles and remote-controlled underwater vehicles. Companies will work with no fewer than four Japanese ministries, representing trade and industry, science and technology, land and infrastructure and the Internal Affairs Ministry and there are hopes that the proposed recovery of resources could go ahead in as little as five years. The government is putting aside a portion of the 50 billion yen (352.3 million euros) budget for strategic innovation projects to support the ambitious drive, with organizations such as the Japan Agency for Marine-Earth Science and Technology tasked with developing submarines that can operate at depths of up to 3,000 meters and large-scale excavation ships. “This issue is becoming quite urgent for Japan because the government’s growth policy to date has largely focused on the weakening yen, which means that all imports of resources and energy are very expensive,” said Martin Schulz, senior economist at the Fujitsu Research Institute. “Japan has to reduce those costs over the long term and developing these undersea resources is becoming much more economic than it was before,” he said. “It is also important in terms of Japan’s energy mix as it does not seem likely that the nuclear reactors will be restarted in a significant way in the immediate future,” he added. “Exploring close to Japan’s coastline for these resources makes complete sense, although we also know that methane hydrates can be extremely dangerous to collect and develop,” he said. At the same time as Japan attempts to reduce its reliance on expensive imports and distance itself from relying on volatile suppliers of rare earth minerals – such as China – it is also in a hurry to learn more about the geological structure of the surface of the Earth close to the Japanese archipelago and the threats that natural disasters pose. a Chinese navy missile frigate passing a drilling rig at the Tianwaitian gas field in the East China Sea, taken by Japanese Maritime Self-Defense Forces patrol plane on 09 September, 2005. The drilling being conducted by the Chikyu is to examine the layers beneath the seabed in the Nankai Trough. In March last year, a study by the Central Disaster Management Council as a direct result of the impact of the earthquake that struck northeast Japan predicted that a magnitude-9 quake in the danger zone could trigger a tsunami as much as 30 meters high that could kill 320,000 people. The disaster would destroy road and rail links the length of the country, the tsunami would pulverize buildings that had already been weakened by the tremor, infrastructure would be wiped out for hundreds of kilometers along the coast and the projected cost in terms of the damage wrought on the country is 220 trillion yen (1.84 trillion euros). Given the scale of the threat, scientists say there is no time to lose in trying to determine when and precisely where the disaster might strike.